Aremo Idiose Grade C Customary Court, Agodi Gate, Ibadan, Oyo State has dissolved a 10-year-old marriage between a couple, Saheed Adebimpe and Omolara Adebimpe. 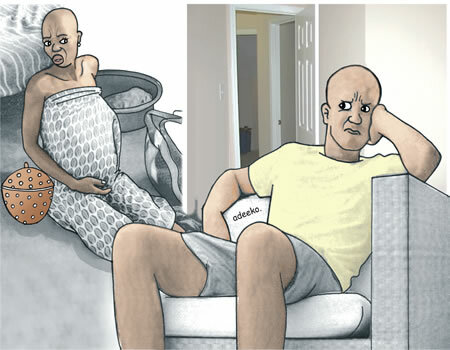 Saheed had dragged the wife to court over troublesome behaviour. He stated that his wife had failed in giving him rest of mind. He thus pleaded with the court to put an end to their marriage which has produced two children. “My lord, Omolara does not give me rest mind. I have reported to her parents but she has failed to change. I can’t tolerate her any longer. “She told someone to tell me she was dead and I rushed home. But on getting home and to my utmost surprise, she was alive. I was mad with her and rebuked her, but rather than show a sign of remorse, she grabbed my shirt and fought me. Omolara appealed to the court not to dissolve their marriage even though all her efforts at reconciling the plaintiff had proved abortive. She agreed to have deceived her husband that she was dead but added that she meant to save him from an imminent death lurking around him. “My lord, although my husband parked out of the house six years ago, I do not want to divorce him because I love him. I have tried to reconcile with his family but his father failed to show up at the meeting. “It is true, I lied about my death but I did it to save him of an imminent disaster as I was told by somebody that he would die. Ruling after listening to both parties, the court president, Chief Amusa Makinde dissolved their marriage and granted custody of the first child to the plaintiff while the custody of the second was awarded to the defendant. The plaintiff was ordered to pay the sum of N3, 000 monthly for the last child’s feeding allowance.